Life of Pixel has come a long way since we last reviewed it almost a year and a half ago on the Playstation Mobile platform. At the time developer Super Icon was self-publishing on Sony’s open platform and what they created was a gem of a title at just around a dollar. You can read my previous review if you’re interested but suffice to say that despite the Playstation Mobile platform being dead, the game lives on in all its glory on the Vita (although you cannot search for it, you must browse the Playstation Mobile tab in the Vita store). After a few attempts to expand the license and platform, Life of Pixel has re-emerged, this time on PC, with a slew of changes (mostly for the best) and three more platforms for your retro gaming bliss. I must admit that the game is addicting and right at home on mobile, but that there’s definitely much to be gained by planting this tightly timed platfomer on bigger screens. Retro “style” has become exponentially popular these days. What started as an amusing aesthetic for Mega Man 9 or upgraded project like Retro City Rampage has spawned a rush of pixelated, sprite-based games that may look like they came from yesteryear but play like anything but. To the untrained eye (or non-technical gamer) these are nothing more than cash-in titles hoping to embrace the nostalgia of gamers like myself and strategically place a casual game in a 1985 wrapping. My only exception to this style probably lies in titles like Retro Game Challenge on the DS, which fully recreated new games that actually play like old games, or titles like Pier Solar on the Genesis, which is an actual title that plays on the console. 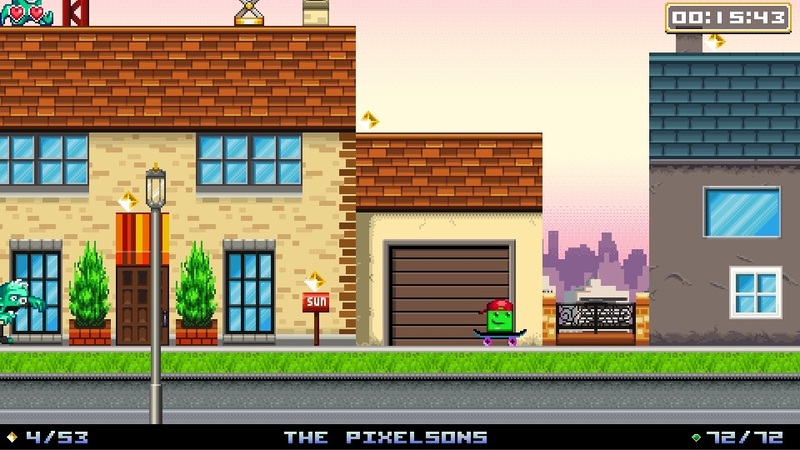 Life of Pixel rests just in the middle because it plays completely like a game from the past, but also looks like a game of the past as well. The twist: it does this with eight different known consoles/microcomputers. Released on the Playstation Mobile platform, an odd choice at first but completely appropriate in hindsight, you follow a single pixel lost to the annals of history that rediscovers its value visiting a retro game museum. In this museum he discovers that he was quite useful on international consoles Atari 2600, Gameboy, and NES, along with five microcomputers that dominated 80s gaming in the UK. These work as “worlds” for the game, each containing eight levels of pure retro platforming bliss. In truth the levels are nothing special if not for the fact that each level and console looks and acts just like it did in the past, flaws and all. 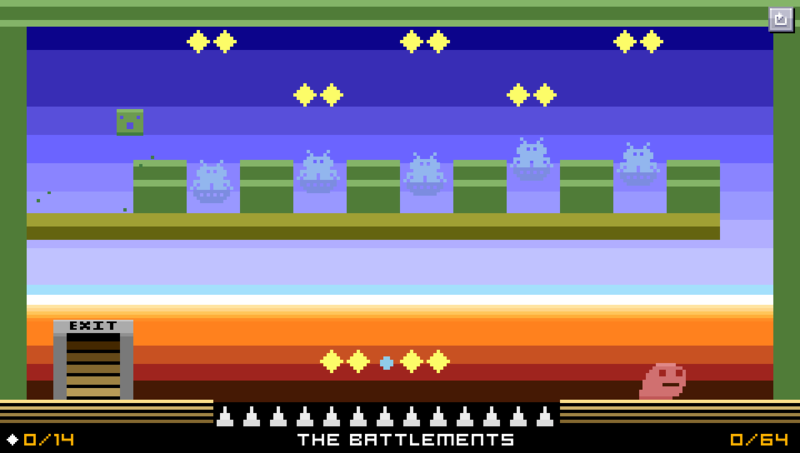 An easy example is that of the Atari 2600, which cannot scroll its screen in any way and thus the levels are contained in what you see. Additionally microcomputers could not scroll at will like the NES could so you have to move screen to screen. These are just a couple of examples of how the particular console you are on relates to the type of tactics you use in each level. This isn’t the only hook, as game design “grows up” as you progress in the consoles, so do the mechanics and gameplay styles. In the end you’re basically playing the same series and concept of game across 8 consoles and more than a decade of hardware and game design. If that doesn’t speak to the retro style I don’t know what does. Life of Pixel is a full retro experience, complete with visual styles that faithfully resemble the aesthetic of that console – you know how each console seemed to have a “look” – and properly credited music that holds as true as the graphics.